...... own needs making organization and presentation of your data a child's play. M-DVD.Org V2 provides you with a full overview of your movie and music collection! The all-rounder software for management of audio and video files; song, album, and movie information, and CD/DVD covers. All integrated under a uniform software interface. 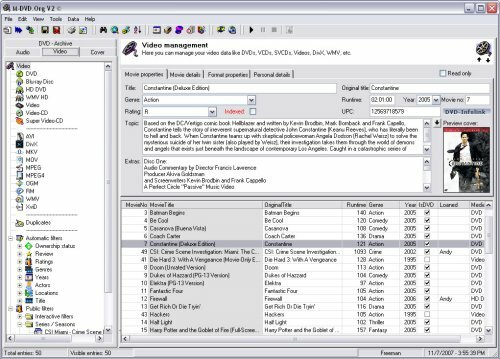 M-DVD.Org V2 provides order, overview, and fills even gaps without long- winded data entry. The software reads hard disks, network drives, CDs, and DVDs and automatically incorporates the multimedia files into the database. With just a few clicks M-DVD.Org V2 saves the information and completes missing details including covers via the internet. A super easy tool to convert DVD to MEPG4 file! Qweas is providing links to M-DVD.Org V2 2.5 as a courtesy, and makes no representations regarding M-DVD.Org V2 or any other applications or any information related thereto. Any questions, complaints or claims regarding this application M-DVD.Org V2 2.5 must be directed to the appropriate software vendor. You may click the publisher link of M-DVD.Org V2 on the top of this page to get more details about the vendor.